A more youthful glow? 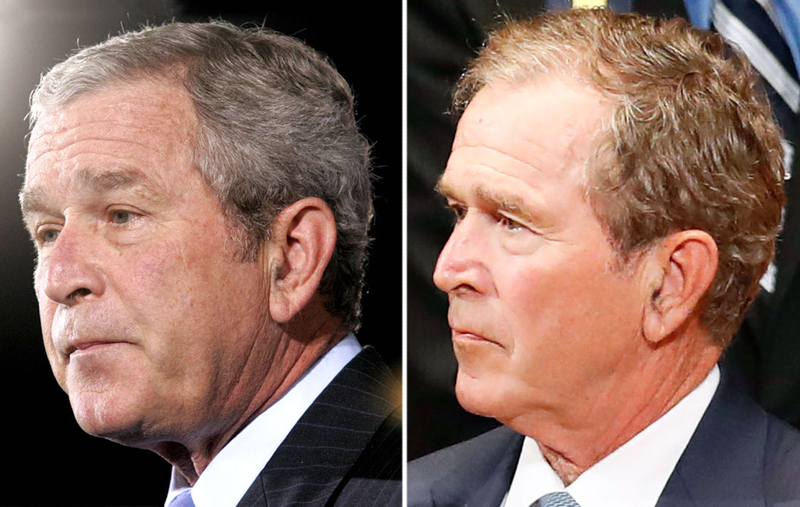 U.S. presidents famously go gray after just a few years in the Oval Office, and George W. Bush is no exception to that rule. Barack Obama vs. George W. Bush: Who Wins the Presidential Dance-Off? In his final year in the White House in 2009, Bush — whose naturally brown hair had already started to go gray at the temples when he was elected in 2001 — had salt-and-pepper strands. As of October 2015, he was mostly silver. But the former POTUS, now 70, has been gradually darkening his hair since early 2016, as seen in February, when he stumped for his brother Jeb Bush in Charleston, South Carolina. Bush, who took up painting as a hobby, fully transitioned his wavy hair into an all-over chestnut hue by Tuesday, July 12, when he made an appearance at a memorial for the Dallas police victims. Twitter was quick to notice the change. Last time I saw George W Bush he had grey hair. Today he has brown hair ?? 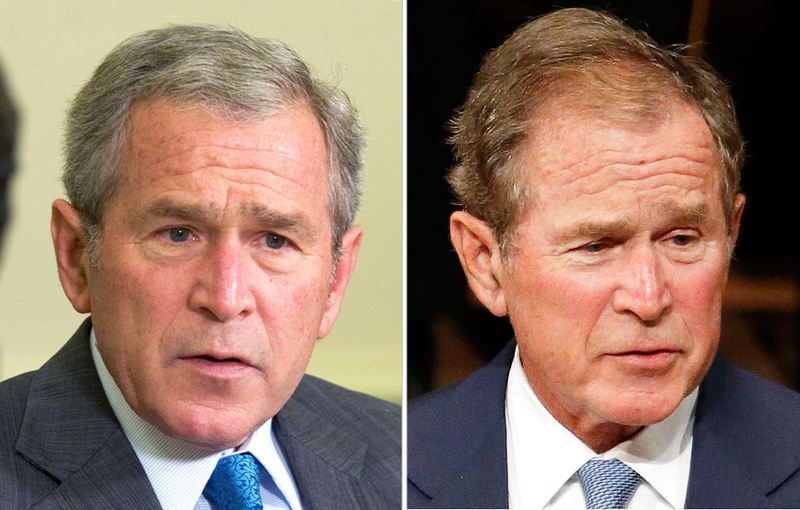 George W Bush's hair is darker now than it was at any point in his presidency. The former Texas governor paid his respects to the five officers who were killed at a Black Lives Matter protest along with his wife, Laura Bush, President Barack Obama, first lady Michelle Obama and Vice President Joe Biden. As previously reported, a sniper shot 12 police officers and two civilians in downtown Dallas on Thursday, July 7, fatally hitting Brent Thompson, Michael Krol, Patrick Zamarripa, Lorne Ahrens and Michael Smith. "We&apos;re proud of the men we mourn and the community that has rallied to honor them," Bush said at the event. "These slain officers are the best among us. In their deaths, we have lost so much. We are grief-stricken, heartbroken and forever grateful." Obama, 54, hailed the five slain officers as heroes. "When bullets started to fly … they did not flinch," he said at the interfaith service. "In some cases, helped by protesters, they … saved more lives than we will ever know."